2: Which Phoenician mother city founded Carthage? 3: The name Carthage or 'Kart-Hadash' in Phoenician means�. 4: Which of the following cities was not originally a Phoenician / Punic Colony? 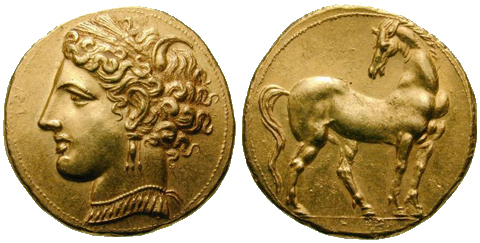 5: The face on this Carthaginian coin depicts which Goddess? 7: In which war did Carthage lose control of the island of Sardinia? 8: Which Spanish city did Hannibal besiege that led to war with Rome in the Second Punic War? 9: Which Roman Statesman famously said "Carthago delenda est" (Carthage must be destroyed)? 10: Which Roman Emperor had the City of Carthage rebuilt on its original spot?